Jakob and Nathan are reading buddies at school this year. 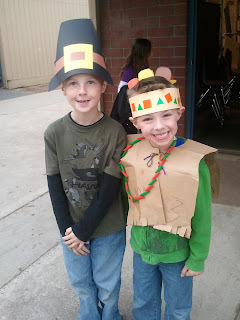 So my little pilgrim and little indian got to have a thanksgiving feast together at school and at Grammie and Grandpa's house! They are so cute and I could not be more thankful for these two. I am so thankful for the 40 chef boards that were shipped out on Wednesday on time going to the Williams Sonoma distribution center for online sales! I am thankful for a wonderfully nice winery in town "Lange Twins" that is purchasing a smaller version of our chef board thus giving me a new idea for a new cutting board. I am thankful for the wonderful comments and ideas I get from people who visit us at the shop, brouse our website, or read my blog.